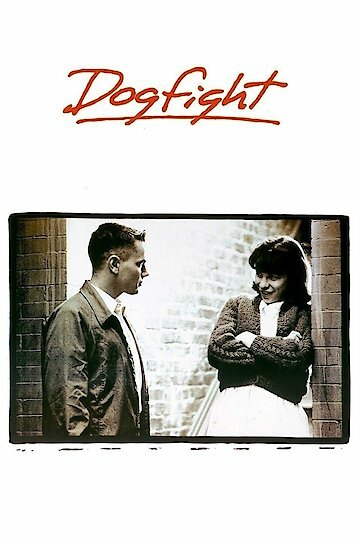 DogFight is about an eighteen year old volunteer Marine who is just one day away from joining a tour in Vietnam. The Marine and his friends plan one last fun night out in San Francisco before they have to go on duty the following day. The Marines decide to form a competition called a dog fight and each Marine is required to throw in fifty dollars. The Marine who wins the competition will be awarded all the money. The competition is to see which Marine is able to bring the ugliest women to the party by the end of the night. Eddie is the main character in the film and asks a girl who works at the local coffee shop to be his date. However, Eddie soon finds himself falling in love with the girl he originally meant to be a joke for the night. Once the woman finds out, she is disgusted with Eddie and wants nothing to do with him. Eddie goes through the rest of the film convincing this girl, Rose, to forgive him for having such childish behavior in the past. Dogfight is currently available to watch free on Vudu Free and stream, download, buy on demand at Amazon, Vudu, Google Play, iTunes, YouTube VOD online.